The New Year can bring about a sense of excitement about what’s to come, hope and the possibility for change. For some, it can also come with a sense of loss at the passing of another year or anxiety about changes ahead – relationally, financially or physically. Most of us have goals or changes we want to make in our lives or our relationships but many times we don’t see the changes through which leaves us feeling frustrated and discouraged. Less than half find that their goals are sustainable past the 6 month mark and struggle with maintaining positive change. One of the biggest areas in our lives that continually needs work and is our relationships. 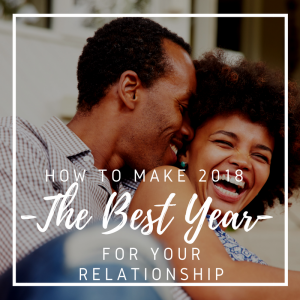 The new year can be an opportunity for us to focus on how to improve our most important relationships. However, most people don’t identify being happier in their relationships as their new year’s resolution. Often, people try to look at themselves from an external, more tangible perspective – i.e get a new job, ask for a raise, lose 20 pounds or run a half marathon. What most people don’t consider is if we focus on our relationship, it can actually help us achieve those other goals by providing us with support, encouragement, better health and more motivation to be better and do better in our own personal goals. Take some time to examine how you are feeling about your relationship. Emotions can be potent motivators for change. Sometimes we are encouraged when we feel positive emotions such as hope, inspiration and pride but negative feelings such as fear of loss or disappointment can also be powerful motivators. Spend some time identifying your feelings and sharing them with your partner. Talk about why you want to change and ask them what they’d like to work on in your relationship. Change requires risk and that can be scary. Things might not go according to plan, you might find yourself disappointed or emotionally wounded. First consider your motivations for change (the why) and then practice some self-encouraging thoughts about times in the past where you were scared to take a risk and it turned out well. Even if it didn’t turn out well, you probably learned something from the experience. Through change we often confront aspects of ourselves that we may not know or like and this can be tough – but it’s normal and it’s how we learn and grow. Change is uncertain. The only way to change is to take a leap of faith that involves a fundamental belief in the vision of who, what and where we want to be in the future, including what your relationships look like. Regardless of the source of your faith, practice spending time believing in your higher power and yourself – pray, meditate, spend time in nature – do whatever helps you feel grounded and connected to the world around you. Change will inevitably be met with obstacles. Stop and consider if you need to push through those obstacles or change course and work around them. Whatever you do, don’t give up just because it gets hard. Change is challenging and relationships are hard but both are vital to our happiness. The resolve to stick it out and fight for what we want motivates us to engage in the here and now process of change, especially when things get difficult. Talk about the obstacles and your fears with your partner. Allowing yourself to be vulnerable can be a bonding experience and help your mate understand you in a different way. There are specific areas to focus your energy when trying to make positive changes in your relationship. Talk to your partner about possible obstacles, identify a plan, encourage one another, create action steps and recognize things will not always go according to plan and that is ok – together you can adapt and persevere. If you think you need help or support in creating lasting change in your relationship, our team of relationship experts would love to help. FTAJ can help you explore your relationship and the changes you want to see by discussing your goals and creating a plan of action in couples counseling. Or consider our upcoming Luxe couples retreat. It’s designed to provide an opportunity to help you learn how to identify your needs, communicate more effectively and create more physical and emotional intimacy. Click here if you’re ready to schedule an appointment today or here if you’d like more information on our Luxe Couples Retreat and how we can help you make 2018 your best year yet.